It is important to verify your contractor carries not only liability but workman's compensation insurance. Most venues will require proof of liability, but many are now asking for proof of workman's compensation, due to possible liability for any injuries incurred by the contractor during delivery, set up and operation. In short, if your contractor does not have a liability and workman's compensation policy, you could be liable for any damage to the venue or injury incurred to the workers while they are working for you. 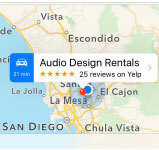 Audio Design Rentals Inc. is fully licensed and insured. We are happy to provide additional insured certificates and proof of workman's compensation on request. If the venue supplied you with any documentation you can upload it here.